Bill and Sue-On Hillman ~ Brandon Now! and met a boy with music in his soul. 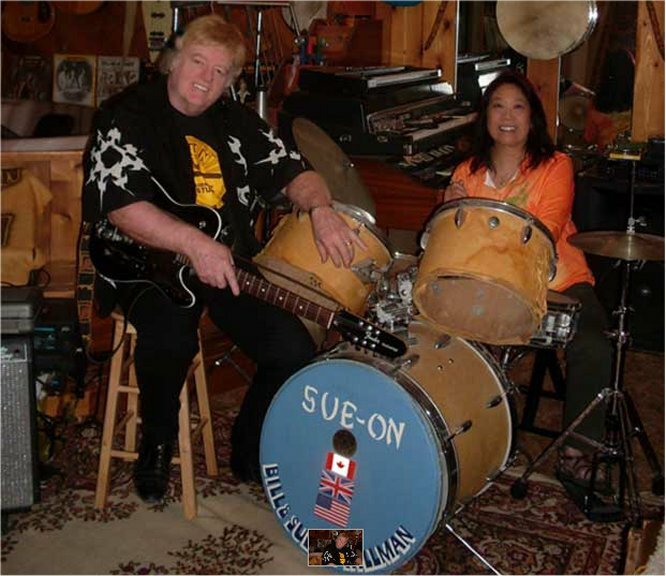 Bill and Sue-On Hillman surrounded by musical instruments in their home studio. After forty-six years of marriage, Bill and Sue-On Hillman continue to make music – literally and figuratively. Bill Hillman would have been a musician with or without his family’s approval. He was born to play. However, Bill’s mother and her brothers played in a dance band, and growing up there were family jam sessions as Bill, his parents and sister all played an instrument. “My parents’ social life mostly involved jam sessions with friends. Dad blew the trumpet and mom played accordion, and piano when available,” Bill says. After high school graduation in 1961, the young guitar player left his hometown of Strathclair and headed to Brandon University (then Brandon College). It was the beginning of the fusion of music and education that would inspire and fulfill him always. “I earned much of my tuition and spending money by working with a multitude of bands,” says Bill. He also teamed up with classmate, Barry Forman, to perform on the CKX-TV Noon Show. Barry and Bill also joined a group of performers on a weekly TV gig, Co-op Jamboree, that involved live appearances in every Westman town with a Co-op store. “These were great show biz learning experiences as we had to put together shows that would entertain audiences of all ages,” says Bill. When the Co-op shows went into hiatus during the summer, Bill and Barry played the Manitoba Fair circuit, hiring pickup musicians to fit the size of the job. Bill’s roots in the Strathclair area were very deep, he grew up on the farm his great-grandfather homesteaded in 1878; his mother’s family were also longtime area residents. Meanwhile, Sue-On and her parents were living a very different kind of family life. Her grandfather immigrated to Canada from southern China in the early 1900s. Government policy made it difficult for Chinese immigrants to bring their families to Canada, so he only saw his wife and children during periodic visits to China. Eventually, he managed to bring his son, Soo Choy, to join him in Manitoba. Soo operated a restaurant in Newdale, a few miles east of Strathclair, while his wife, Yook Hai and four children remained in China. With the communist takeover of China in 1949, life became very difficult for the family. Yook Hai and her children were barred from leaving the country, but she defied the regime and succeeded in the sending her children to Hong Kong. Soo was able to bring Yook Hai and Sue-On to Newdale in 1958. Moving from Hong Kong to a tiny, rural town, in a country that didn’t speak her language, was a dramatic change for ten-year-old Sue-On. Her life revolved around school, working in her father’s restaurant, choir and piano lessons over the next six years. Although she and Bill lived in different communities their paths did cross; what started as a friendship became a courtship and at eighteen Sue-On was ready to make another significant lifestyle change. Bill also had another good reason to include Sue-On in the band. “I saw too many relationships suffer because the guy was always away from home, playing in a band, and I didn’t want that to happen to us,” he says. Sue-On was happy to comply. “It would have been really boring to just sit and watch the band play,” she says. Being a singer and drummer in Bill’s new band, the Western Union, would definately not be boring. The couple moved to Brandon two years later to pursue what would now become a mutal lifelong passion – music and teaching. They enrolled at Brandon University to complete Bachelor and Education degrees, with music helping to cover expenses. It helped that Brandon had a thriving live music scene. “We played in pubs every night, moving from the Cecil to the Brandon Hotel Viking Room to the new Beaubier,” says Sue-On. They also performed numerous series of CKX-TV shows. This hectic lifestyle didn’t stop them from graduating with top marks; Bill also earned the Brandon University Silver Medal in Geography. The couple returned to Strathclair and teaching jobs, which meant they could go on the road during the summer. Through the ’70s and ’80s the couple toured western Canada, the U.S. and completed three tours of England. Their touring band, The Hillman Express included Kevin Pahl and Kerry Morris who were also from Strathclair. They also worked on several other recording and video projects. “Over half of this material was recorded in three English studios during our tours of the U.K.,” Sue-On says. Touring downtime for these musicians meant taking in the sights of the cities they visited and sparked a lifelong love of travel. Bill and Sue-On capped off the ’70s with the 1979 Manitoba Music Entertainers of the Year Award for Country Music. During the 1980s family life was beginning to take a more prominent role as they were now parents of three young children. Sue-On and Bill weren’t touring as often, instead, they took on a new type of musical challenge. “We were hired as a feature act and part-time organizers of the Boggy Creek Mountain Music Festival,” says Sue-On. The weekend event, held in the Duck Mountains, featured entertainers from across Canada and United States. It drew an audience of 20,000 people, making it one of the biggest outdoor music festivals in the country. With the family home near Strathclair as their base, the couple now focused on teaching, music and their children. Sue-On had left the on-call-practically-24/7 family restaurant lifestyle far behind. Or so she thought. When the opportunity came along to buy Soo’s, the popular Brandon restaurant her father and brother, Kenny Choy, established in 1970, Sue-On found that the attraction to the family business went deeper than she realized. The Hillman’s purchased Soo’s in 1992. They now had the opportunity to create what surely must be every musician’s dream – their own performance venue. This was part of an extensive remodeling and expansion the couple began soon after taking over the business. The family moved to Brandon and Bill commuted to his teaching job at Strathclair Collegiate until 1997, when he took early retirement. After a four-year hiatus, Bill returned to education; this time as a Brandon University professor. He first reconnected with the Faculty of Education in 1990, to complete a Master of Education degree. Now as a faculty member, Bill designed and presented courses on Technology and Computers, Journalism, and Communications for the Brandon University Northern Teacher Education Program. He then taught on-campus courses on Computers, Technology and the Internet before retiring in 2008 as an assistant professor. In 2002, the couple closed Soo’s restaurant and Sue-On returned to teaching, in Brandon University’s English for Academic Purposes program. Today, Sue-On continues to teach and Bill is occupied with projects that include research into the influence of American author, Edgar Rice Burroughs on all facets of Western popular culture and media. While the couple continues to perform for special occasions, their summer touring is more likely to be travelling for pleasure. Bill and Sue-On are warm and gracious people with wide ranging interests, (they each have a black belt Wado-Kai Karate), who inspire students and bring joy to audiences with their music. Those adventurous grandfathers had no idea when they settled in Manitoba they were setting the stage for two soulmates to find one another. Hillmanweb.com presents an extensive record of the couple's music career and family histories, collections that include photo archives of Brandon, online military history tours and Manitoba cultural sites. They also maintain sites for Brandon’s Commonwealth Air Training Plan Museum and Westman Chinese Association, among many others. It’s easy to understand why the Hillmans have been in demand as performers for over four decades after listening to their extensive recording collection, available online. Hillmanweb.com also publishes ERBzine, a 10,000-Webpage resource devoted to Edgar Rice Burroughs. “He was the master of fantasy adventure, and the grandfather of American science fiction. His fiction influenced films like James Cameron’s Avatar, Steven Spielberg’s Raiders of the Lost Ark and George Lucas’ Star Wars,” says Bill, who has been a Burroughs fan since childhood.